The European Union agreed to a multi-billion-dollar deal with Turkey on migration Sunday to address the flow of migrants that has swamped both of them this year as conflicts and instability in other parts of the world forced huge numbers of people to leave their homes. A summit in the Belgian capital, Brussels, drew Turkish and European officials to discuss a $3.2 billion aid package intended to help Turkey cope with the millions of refugees it is hosting. The largest group of Syrian migrants arriving in Europe this year have passed through Turkey on their way to Greece or Bulgaria. 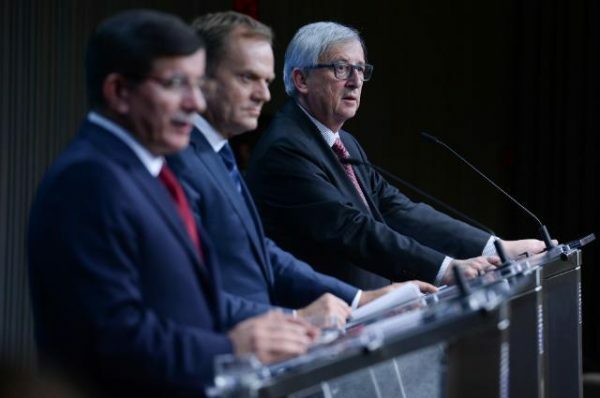 “Our agreement sets out a clear plan for the timely re-establishment of order at our shared frontier,” European Council President Donald Tusk told a news conference with Turkish Prime Minister Ahmet Davutoglu and European Commission President Jean-Claude Juncker. Turkey was declared eligible to join the 28-member bloc in 1997 and officially began the process in 2005.